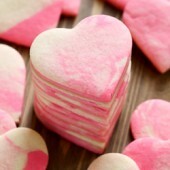 Classic homemade sugar cookies with a fun marbled twist for Valentine's Day. A festive treat for the entire family! In a large bowl or stand mixer, beat together butter and sugar until light and fluffy. Mix in egg and vanilla, followed by salt and baking powder. Scrape the bowl as needed. Gradually mix in flour, increasing speed as needed until dough is fully combined and no streaks remain. Divide dough in half, transferring half to a clean bowl, set aside. Add a small amount of dark pink gel food color to the remaining dough. Beat until fully tinted and no streaks remain. Pinch off golfball sized portions of dough, rolling into balls. Create a pattern of alternate colored balls of dough on your work station. Gently, knead all dough together until swirls of color are visible. Do not over mix. Shape into a disc and wrap in plastic. Chill for 30-60 minutes. Roll out dough to 1/4-inch thick, on a lightly floured surface. Cut out desired shapes. Space 2-inches apart prepared baking sheet. Freeze cookies for 15 minutes. Press together remaining dough and scraps, rewrapping in plastic and keeping chilled until ready to roll and cut again. Bake at 350°F for 12 minutes. Allow cookies to rest on the pan for 2 minutes before transferring to a wire rack to cool completely. Store cookies in an airtight container for up to a week. Recipe yields roughly 2 dozen cookies. This will vary depending on the size of the cookie cutter used and thickness of the dough.